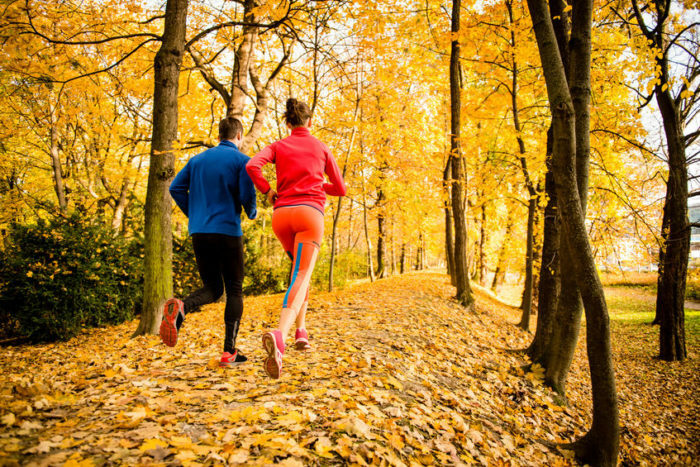 Autumn is in full swing, which means race season for all you runners. The crisp mornings, fall foliage, and the promise of a hot cup of apple cider post run are just a few of the many reasons runners claim fall to be the best season for training and races. Picture yourself stepping out onto the crisp fallen leaves littering the ground of your favorite trail, pulling your jacket tight as you set out at a relaxing pace, and taking in all the different colors of the leaves just as the sun is rising. Sounds absolutely perfect right? Until, you suddenly step onto a tree root hidden under all those colorful leaves and your ankle rolls out causing a severe inverted ankle sprain. Now you are forced to wear an air cast and use crutches for the next few months depending on the severity of your sprain. To make matters worse, now you get to join the ankle instability club with all us athletes who have torn a ligament one way or another. Once a ligament is completely torn, your risk of suffering another sprain is increased. Ankle ABC’s– While in a seated position, “write” the ABC’s in the air with your foot, only moving your ankle joint. This exercise strengthens the muscles surrounding the ankle. Plantar Flexion with Resistance Band– Bend your knee while sitting on the ground and place your heel on the ground with your toes in the air. Loop the resistant band under the forefoot and slowly attempt to flatten your foot on the ground, going against the resistance band. Do 10 reps 3 times on each foot. Warm up/Cool down– This may sound like common sense, but warming up before every run or athletic event/practice is essential for injury prevention. Dynamic exercises are encouraged to properly warm up each muscle group and increase heart rate. As for a cool down, jogging or walking for ½ -1 mile at a slow recovery pace to bring the heart rate down and static stretches are recommended. Zamst Filmista– All of these exercises are designed to strengthen the ankle in order to reduce the risk of further ankle injuries. However, during competition, or a trail run, wearing a compressive ankle brace is recommended. The Filmista by Zamst is designed to mimic a tape job and has a second skin feel to it. This lightweight brace can easily fit into track spikes, soccer cleats and any type of athletic shoe comfortably. Use these recommendations to either prevent an ankle injury from occurring, or to reduce the risk of experiencing another sprain of a weakened ankle. Strong ankles are essential to any sport, so try these exercises regardless of previous injuries or not. Pain in the Lower Back; Injury or Not?